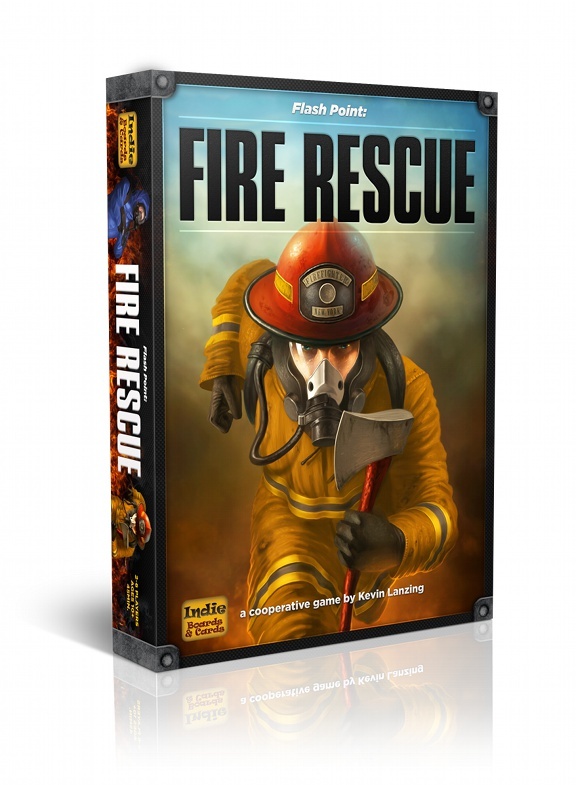 Overview: For those who love cooperative board games like Pandemic, there’s a new game to get your pulse pounding: Flash Point: Fire Rescue. You and your fellow gamers are firefighters pulling victims out of a burning house before it collapses. Watch out for hazmats that could explode if the fire hits them, and be sure to extinguish flames and smoke before things spread! Note: the game is only available through a Kickstarter campaign at the moment; you have only until tomorrow morning (Thursday) to pre-order a copy. Update: Although the Kickstarter campaign has ended, you can still pre-order Flash Point: Fire Rescue from Indie Boards and Cards, to be shipped to you or picked up at Essen this year. Retail: $45 on Kickstarter to pre-order the game; will eventually be sold at a higher retail price. Who Will Like It? Gamers who like cooperative games will appreciate the teamwork and strategy required to succeed, plus kids who want to be firefighters. Two sets of rules (family and experienced) make it appropriate for a broad audience. Various role cards (Note: not final artwork). 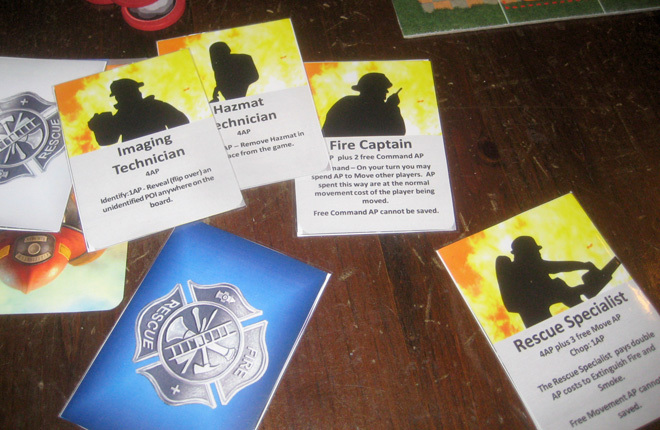 The theme of the game, of course, is firefighting. The board represents a burning building, and your team of firefighters moves through the building, extinguishing flames, rescuing victims, and even chopping down walls when necessary. The game does a pretty good job of representing the difficulties of the task and the different skills of various specialists. However, it does seem a bit weird that people will randomly appear throughout the house during the game — but that’s probably more necessary for gameplay than an accurate reflection of a rescue. I got to try out the game on a prototype copy, so I can’t say what the final components will be like as far as quality. However, the artwork of the board itself and the images shown on the Kickstarter page of the various specialists is really nice. I just hope they get more balanced dice: the copy I played tended to roll 6s on the d6 much more than seemed statistically appropriate. 2 dice: a d6 and d8, which are used as coordinates to locate spaces on the board. Flash Point: Fire Rescue has two sets of rules: family rules that are more streamlined and easier to learn, and experienced rules that introduce different roles, hazmat items, and rescue vehicles. I’ll outline the family rules first, and then mention the differences for the experienced rules. The board is set up with some initial fires in the house and three Points of Interest (POI). Most of the POI are victims, but some are false alarms, and you have to get to them to find out which they are. The firefighters start outside at any of the four exterior doors of the house. Within the house, there are a lot of doors, which start off shut. Each player gets four Action Points (AP) to spend on their turn. Moving costs 1AP per space, or 2AP if you walk into a space with fire. Opening or closing a door is 1AP; chopping a wall costs 2AP to place one damage token on a wall. Once there are two damage tokens on a wall, that wall is destroyed and is treated as an open space. Carrying a victim costs 2AP per space moved. Extinguishing costs 1AP to go from Fire to Smoke, and 1AP to put out Smoke entirely. So to fully extinguish a Fire threat, it costs 2 AP. Players may also bank up to four unused AP to be used in later turns. After the player is finished with their actions, the fire advances. The player rolls the dice, which indicates the coordinates for a space on the board. A Smoke token is added to that space. If there’s already Smoke, then it is flipped over to Fire. If there was already Fire, then an explosion occurs, which spreads fire in the four adjacent directions, or can cause damage to walls or shockwaves. Also, after explosions are resolved, any Smoke that is adjacent to Fire is flipped over to Fire. Any firefighters who are on a space with Fire are knocked down and placed back outside of the house, and any victims reached by Fire are lost and removed from the board. Finally, if there are fewer than 3 POI in the house, roll the dice to place new POI tokens. Any Smoke or Fire in the space rolled is removed. You win the game by rescuing 7 victims, and you lose if 4 victims are lost to fire or the house collapses, indicated when you run out of damage markers. If you rescue 7 victims, you can continue playing to see how many people you can pull out. The experienced rules add some variety, plus three difficulty levels: Recruit, Veteran, and Heroic. First, there are different types of firefighters, each with its own abilities (and in some cases, weaknesses). For instance, the Paramedic can spend 1AP to heal a victim, which allows them to walk with a firefighter instead of having to be carried. However, it costs the Paramedic extra to extinguish Smoke and Fire. The CAFS Firefighter, on the other hand, gets 3AP extra for use in extinguishing which can’t be banked; but then only gets 3 instead of 4AP as a regular allowance. The Fire Captain gets an additional 2AP each turn which can be used to move other firefighters, and is extremely useful when you have a lot of players. The full list of specialists can be seen in the rules. You can also change out to a different specialist for 2AP if you start your turn at the fire engine. Another new feature is the vehicles: the ambulance and fire engine. It costs 2AP to move a vehicle to the next adjacent space (there is one on each side of the board for each vehicle). The ambulance can be radioed over, so the firefighter doesn’t need to be in the same space. In the experienced rules, victims need to be taken to the ambulance in order to be rescued. The engine has to be driven, so the firefighter needs to be in the same space and moves with it. Other firefighters present may choose to ride along for free. A firefighter on the engine’s space can fire the deck gun, which can extinguish fire in the house and splashes over to adjacent spaces — however, it’s based on a roll of the dice and sometimes it can be difficult to hit the spot you want. Hazmat items are placed on the board at setup, and will cause explosions if fire reaches them. They have to be carried out of the house (similar to victims), or the Hazmat Technician can dispose of them for 1AP. Also, during setup you place Hot Spot markers on a number of spaces. Whenever a Hot Spot is rolled when the fire advances, it means you roll again. That means that the fire could advance more than once after a turn, depending on how many Hot Spots you roll in a row. GeekMom Cathe Post dropped off the review copy (now that we’re nearly neighbors) after she’d written her review, and I got the chance to play it several times over the course of the week. I played both sets of rules in a five-player game, two-player game, and once with two players using two firefighters each (effectively a four-player game). The family rules are very straightforward and easy to understand. Set up takes a little bit as you place all the doors and fires everywhere, but you can get started pretty quickly and the ruleset is small enough that most people won’t need to refer to the reference card after the first couple of plays. It also seems pretty easy to win: both times I played we were able to get all 7 victims out (and the first time we went ahead and pulled out the other three as well). The first time I played the experienced rules, however, it was a complete disaster. We drew our firefighter roles at random since we hadn’t played with them before and didn’t want to spend time seeing exactly how each one worked before we began, and this was probably our first mistake. We charged in and started getting to the victims and putting out fires, but things escalated rather quickly. We had some pretty unlucky rolls — I mentioned the dice being a bit weird, but I know we rolled the same coordinates three times in a row once. On one particular turn a player hit three or four hot spots in a row, and most of those were explosions, which really did a lot of damage. In the end, we didn’t manage to get a single victim out (a couple died when explosions reached them) and the house collapsed. After that game, I was convinced that the game had some balance issues with that many players, so I wrote to Travis, the game’s designer, about the experience. He mentioned a few things that we might have done differently, so I took these into account when playing again. First, it’s important to start putting out fires and not going after victims right away, because of the possibility of explosions and shockwaves. If you can break up long chains of smoke and fire, it really helps keep the heat down. Also, we didn’t ever change out roles and didn’t make the best use of two very important roles: the Driver/Operator, who can fire the deck gun at a much lower cost and can even re-roll dice; and the Fire Captain, who can help other players move through the house more quickly. But also, I think we probably had some pretty bad luck with rolls. With those tips in mind, I played a few more games with the experienced rules, once with my wife as a two-player game and then once with a four-player game. We won both games, and I did find that with some careful planning you can manage the fires (and particularly explosions) much more easily, though there’s still a bit of luck in where new threats and POIs show up on the board. 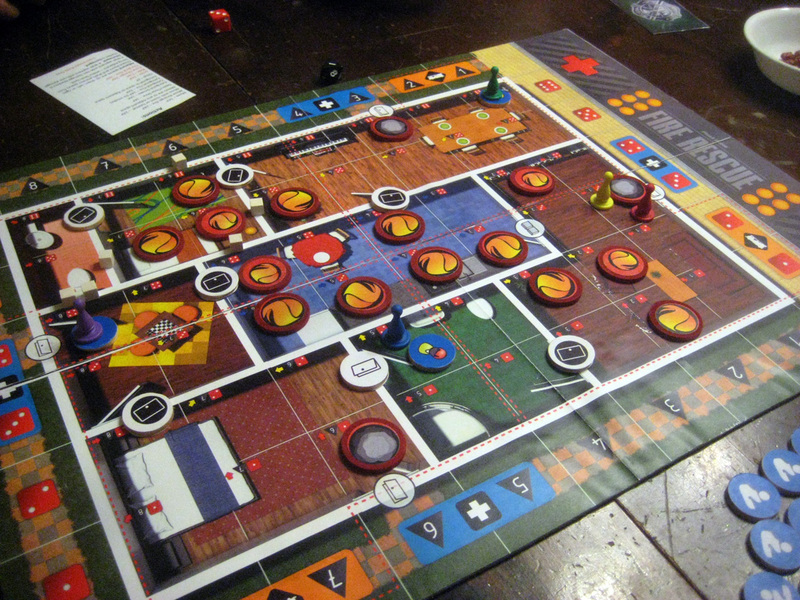 All in all, I think Flash Point: Fire Rescue is a pretty great game and one that I’m going to kick in for my own copy. I think the game really does owe a lot to Pandemic in the way that it functions, but it does have its own feel and mechanics that make it worth having both. Check out the Kickstarter page for more details about the various reward levels — but if you’re interested be sure to commit before tomorrow morning, because the campaign ends soon! They’ve already blown past their modest $5,000 goal by a lot, so the game is guaranteed to be printed, but now’s your chance to pick up a copy with some extra bonuses. Wired: Who wouldn’t want to be a firefighter (at least in a game)? Various specialists are well-designed and game has a great mixture of luck and strategy. Two sets of rules make it great for younger kids and experienced gamers. Tired: Easy level seemed almost too easy. Dice seemed to be conspiring against us. Disclosure: GeekDad received a prototype copy of this game for review.